The Alpine CF is Black Diamond's new Carbon Fiber pole design. I started backpacking and became hooked on the outdoors. I realized that I enjoyed the colder weather and solitude of deep backcountry, and have hiked various environments from the green mountains of the Appalachians to the barren desert of Arizona. My hiking season starts early September and ends early June. I’m usually a moderate weight hiker, but as an Emergency Medical Technician I’m trained to be prepared, so my pack usually weighs between 30 to 40 lbs (13 and 18 kg) while solo, to 60 lbs (27 kg) when leading. Information about the author can be found at http://www.corridor9.net. "If you travel often in colder weather where you demand SAFETY and RELIABILITY, you cannot afford to worry about twisting and tightening your adjustment system. Our Mountain Series Trekking Poles use our patented "Zero-Slip" Flicklock™ system for super quick and easy-to-use adjustments even with gloves on - a mechanical lock that will never let you down." Patented double Flicklock™ adjustment system is quickly and easy-to-use even with gloves on. The FASTEST, QUICKEST, and most SECURE adjustment system - flick closed and GO. Mechanical - locking Flicklock™ does not rely on twisting for friction and does not wear out. These poles arrived via UPS straight to my doorstep in a long rectangular box on November 8, 2006 in good condition and complete. Inside the box was a sealed shipping bag with the poles stuck inside in their retail packaging. I removed the poles from their packaging and read the entire packaging information before freeing the poles for use. The documentation on these poles is extremely concise. Included are instructions on the Flicklock system that the Alpine CF uses as well as the Binary system that is incorporated on a number of other Black Diamond poles. The instructions detail how to adjust the poles, adjusting the Flicklock tension, periodic cleaning, as well as inspection guidelines and directions on how to care and store your poles. "We warrant for one year from purchase date and only to the original retail buyer (Buyer) that our products (Products) are free from defects in material and workmanship. If Buyer discovers a covered defect, Buyer should deliver the Product to us at the address provided. We will replace such Product free of charge. That is the extent of our liability under this Warranty and, upon expiration of the applicable warranty period, all such liability shall terminate." After removing them from the package, the first thing I did was try out the Flicklock mechanism. Opening the locks was fairly easy, but I found that closing them proved to be difficult. The manual said that the lock should "snap" into place, but with all the tension on the lock, it was impossible to get any snap. I read the documentation on this which stated "Your Flicklock tension is pre-adjusted and should not require adjustment." However, the end of the paragraph stated that "[i]f the lever becomes too difficult to snap shut, loosen the screw a bit." After loosening the screw a quarter turn, the locks were much easier to close and there was a physical snapping sensation. I also found that although the locks were easier to manipulate, the locks still held enough friction between the two segments to prevent sliding. I was also pleased to find that I was able to adjust the lock mechanism without any tools other than a fingernail. After extending the poles to around 130 cm (51 in) I placed a good deal of my body weight on the poles. While the lower section did bow a bit, there was no slipping of the mechanism and the poles did not seem to be unstable. The pole handles appear to be constructed of a neoprene style rubber material while the head isn't your typical cork, but a very comfortable plastic and soft rubber mix. The strap runs through a reinforced padded sheath that appears to be made of some open-cell style foam or rubber compound. It provides a great deal of comfort and doesn't seem to have any rough spots that will cause blisters. The straps are easily adjustable without any tools and hold the position they are placed in quite well. The neoprene style handle extends a good 6 in (15 cm) past the bottom of the molded handhold section. This allows one to grip the lower section while climbing hills without needing to adjust the pole length. I was a bit concerned with the way the hand section was molded though. I had to squish my fingers together to get them to fit inside the molded area. Due to the way the handle is constructed, my only other option is to have my index finger ride on the head of the pole in order for the rest of my fingers to move freely within the molded handhold. If the handhold was molded just .5 in (1.25 cm) longer, my entire hand would fit comfortably. I may have oversize hands compared to the norm, but the fit becomes worse while wearing gloves. At the tip of the Alpine CF poles is a replaceable carbide tip , a threaded shaft that allows for extra basket placement (3/4 or powder baskets), and a smaller trekking style basket that appears to remain in place even when additional baskets are used. Although I haven't had these out in the field much yet, I was surprised at how quiet these poles seemed to be. 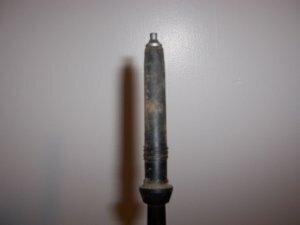 There was no internal clicking from pole sections grinding together. I will be looking into this a lot more throughout the testing period. I would like to thank Black Diamond and BackpackGearTest.org for allowing me the opportunity to test these poles. I've tested these poles in a number of locations throughout the Field Report phase. These poles have seen trail use on a number of day trips as well as multiple two-night trips where the terrain ranged from flat lands with elevations of 400 ft (122 m) to mountainous regions with elevations above 6,640 ft (2024 m). The weather that the Black Diamond Alpine CF Poles have been exposed to has ranged from 75 F (24 C) to 45 F (7 C). Well, I've put myself in a position this time. When I first got these poles and tried them out I didn't really think they were anything special. After using them a few times I told my father that I'd part with them after the test was over. I don't think he's going to be happy when I tell him I've decided to keep them. These poles are the best thing since sliced bread, and that's saying a lot coming from someone who's sworn off poles for years. 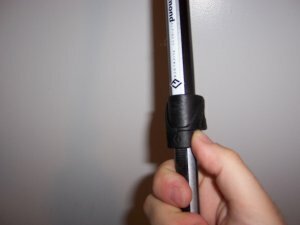 Coming from a background of standard twist-lock style Wal-mart poles, I was extremely happy to experience the ease of use that the Flicklock system provides. 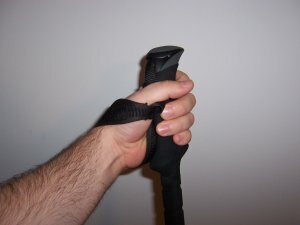 With a simple flick of the wrist I am able to extend or retract my poles quickly and easily. No more fumbling around with gloves trying to get enough grip to loosen the poles. I no longer have to worry about the pole shortening while I'm trying to tighten it or not being able to get it tight enough. I've found that I no longer worry about getting these poles exactly the same length anymore since it's so easy to change lengths if I need. I spend less time playing with the poles and more time enjoying the outdoors with them. While I wasn't initially pleased with the grips, getting used to the new Alpine CF's was relatively easy. I've learned to hold them a bit differently and they no longer cause too much discomfort on my hands, though I still wish the grip was a bit wider as per the picture above. 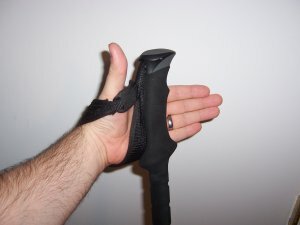 The extended lower grip has been exceptionally helpful while climbing hills, but I have found that for repeated short climbs it's easier to use the standard grips rather than constantly removing the straps from my wrists. I did find that the straps are extremely comfortable and at no point during my use have I developed blisters or had places where chafing occurred. The grips have no slip to them even when my hands are saturated with sweat. The top of the grip does become a bit slick due to the fact that it's a bit more rubberized material than the foam style grips, but I have yet to lose a pole while going downhill like I have with previous poles. I have noticed that the strap is a bit narrow when wearing my gloves though and at times have had to remove my gloves, or had my gloves fall off, when removing my hands from the straps. As stated above, extending or retracting these poles is extremely simple, even with heavy winter gloves on. While it did take a bit of time to realize exactly how I had to position my thumb to get the most leverage on the Flicklock, I have had no problem since I've learned the best way to open and close the mechanism. The best part about this mechanism is that its design allows different ways of opening. For example, while I may use my thumb for leverage on the Flicklock when I'm wearing thick winter gloves, I often find myself using my finger to wrap the pole and twist it open when my hands are bare. Here's the kicker; at no point in time has the Flicklock mechanism slipped to date! I've had considerable weight on these poles while descending troublesome terrain and not once have I felt as if the poles were unstable, or that I couldn't put more weight on them for fear of failure. These poles are rock solid! I've got to be honest, I've tried everything I can think of to try and get these poles to slip. I even did a little experiment where I stood on a scale and distributed 2/3 of my weight to the poles. That's 75 lbs (34 kg) per pole without even the slightest inkling that they were going to give. Mind you, I'd rather not try this in the wild as I'm not sure the poles can take the lateral stress if I were to become unsteady, but it was comforting to know that if I was in need, I could rely on these poles without question. Initially I was a bit disappointed that the baskets aren't completely removable, but looking at the design with a little help from my editor I realized that the baskets were removable but the design of the baskets was ingenious. It is virtually impossible to lose a basket since one must apply constant pressure to even get the baskets to engage the threads. Basically the diameter of the basket threads is a bit smaller than the diameter of the pole threads. This means that you must force the threads of the basket onto the threads of the pole in order to remove the baskets completely. Otherwise, the baskets just spin freely on the pole without ever engaging the pole threads. The baskets are definitely small and for hiking only as they lack the surface area to make them useful for snow travel. At this point I cannot comment on the bailing of snow under the baskets due to the unseasonably warm weather that we have been happening in the Midwest, but I will be seeing snow this weekend and will give more details soon. These poles have yet to have any nicks or scrapes on them so far, but maybe I'll be able to comment on this for the next report. While these poles haven't seen a great deal of temperature change so far, I haven't noted any difference in the flexibility of the carbon fiber so far. I will be heading on a 6 night cold weather trip this weekend so be sure to look at the LTR for my experiences in 3 months. Throughout the entire long term testing period I have been able to use these poles quite a few days on various outings. These outings ranged from multiple-night trips in the mountains to day trips through the local woods. The elevation in the woods around the house is roughly 460 ft (140 m) above sea level, while the highest elevation I used these poles at this phase was around 6,640 ft (2024 m). They have also been exposed to a number of various weather conditions from freezing rain and temperatures around 18 F (-8 C) up to temperatures around 65 (18 C). I've used them in swampy muddy conditions, hard rocky terrain, sandy conditions, and dry grassy areas. These poles rock! I am exceptionally pleased with the way the Black Diamond Alpine CF poles have functioned throughout the entire test period. I was able to use these poles on a long 4 day hike this last period, and during this time I exposed these poles to a number of conditions they had not seen previously while testing. During this time I was able to expose these poles to hard rocky sections of trail as well as extreme cold. I had expected these poles to become brittle during the cold weather, but was surprised to find that they stood up to a number of scrapes and jams. During one climb I had even wedged the pole into a crevasse between two rocks without knowing it. When I put my weight on the pole to move forward it bent slightly, but held my weight and didn't break, splinter, or crack. I all but knew that I had broken the pole for sure and was really surprised that it came out with barely more than a scratch. At no point in time after that was I worried about damaging the poles simply because they were exposed to weather below freezing. In all, I didn't feel much difference when using these in colder conditions than a standard set of aluminum poles. They had the same weight and swing that I would have expected from aluminum poles. I used them just like I would any other set of poles and was very pleased that they held up to the abuse as well as they did. In addition, I was able to test these poles in muddy conditions and found out exactly how useful those little baskets proved at keeping me from sinking in the mud without dragging me down when I needed to move. In addition, I saw no balling of snow under these small baskets, though these poles were only exposed to a limited amount of hard icy show and no powder. As I stated above, I did scratch the poles a bit during one trip. One of the poles has a gouge about 1 mm (.04 in) deep. Upon close inspection, it doesn't look like the scratch penetrated the carbon fiber of the pole section, but merely scratched away some of the exterior resin material. The poles still feel extremely comfortable in my hand. Although, as stated above, I wish the molding of the handle was a bit longer. I have yet to receive any blisters while using these poles, but I did feel some hot spots on my thumbs when I was hiking numerous days with them. I'm not sure if it was the textured rubber material in the grips causing extra friction, or simply the fact that I had been using these poles for 4 days straight, but after a while I could feel a hot spot right inside the most distal joint of my thumbs. It wasn't enough that I was forced to stop using the poles, but I did need to change the way I was holding the poles for a period of time to avoid turning this hot spot into a full blown blister. The padding on the straps helped a lot and allowed me to hold the poles a number of different ways without feeling like the straps were cutting into my palm or wrist. I was also able to wear my glove liners without feeling like my wrists were confined. There was ample room for me to slide my hands into the straps without having to remove the outer layer and use just my liners. Although the poles have an additional lower extension right below the hand mold for choking up on steeper terrain, I didn't find myself using it much. While it looked good in theory, it didn't really work as well as I thought it would. In order to use the lower section, I had to remove my hands from the straps. By the time I removed my hands from the straps and walked 10 ft up a hill, it was time to go back down again. After doing this a dozen times, I was tired of constantly messing with the straps. When I was going uphill for a longer period of time, I found it easier to adjust the length of pole since using the straps and molded hand section was more comfortable than trying to use the lower section of the handle. At no time did the grips become slimy, cause my hold to slip, or retain any sort of odor throughout the test. The only cleaning that I did was a simple washing off in a stream after I fell in a muddy section with them attached to my wrists. Cleaning was fairly simple, and the dirt washed off easily. One of the things that I really like about these over aluminum poles is how quiet they are. Because the shaft is made of carbon fiber, it doesn't tend to vibrate like aluminum poles do. This reduces the sound vibrations produced when the pole strikes a hard surface. The only time I heard any noise emanating from the poles was when I struck a rock or other hard object with the pole tip. This was definitely a pleasant change from noisy aluminum poles. In all, I was extremely pleased with the way the poles functioned, as well as the characteristics that they provided; quiet, single handed operation with positive locks and ease of use. The only thing I would change would be the size of the hand grip. I believe that it needs to be a bit larger for people with big hands. I would however recommend these poles to anyone looking for such wonderful qualities and characteristics in a pole system. While I didn't get much use out of the molded lower extension, I feel that this could well be better used by others. Once again, I'd like to thank BackpackGearTest.org and Black Diamond for allowing me the opportunity to test the Alpine CF poles.